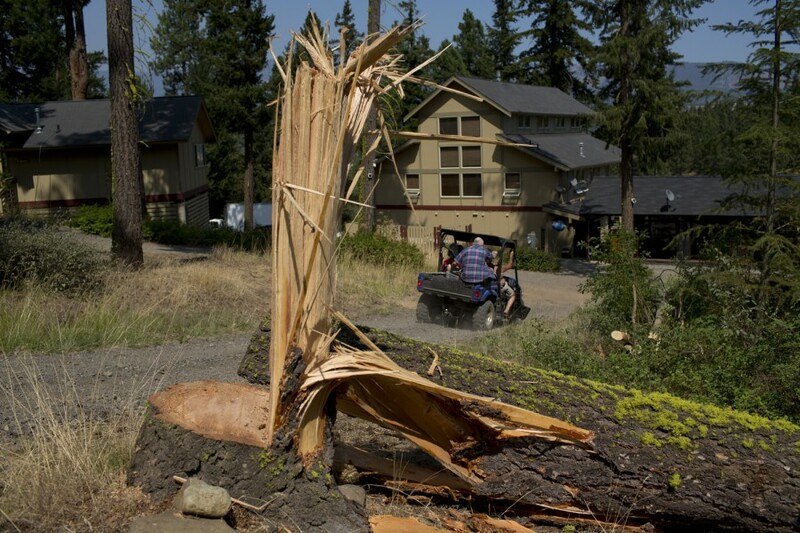 Felled in hopes of saving the property, a massive tree lies on the ground near the Huntley Lodge in Cle Elum, Wash., Thursday, Aug. 16. The owners of the lodge, Greg and Christi Huntley, decided to take the trees down to keep them from acting as fuel for the Taylor Bridge fire that was threatening their property. "We've probably cut down a hundred trees," said Greg Huntley as he looked off the deck of one of the cabins that make up Huntley Lodge and Retreat. Huntley and his wife, Christi, bought the vacation getaway five years ago. 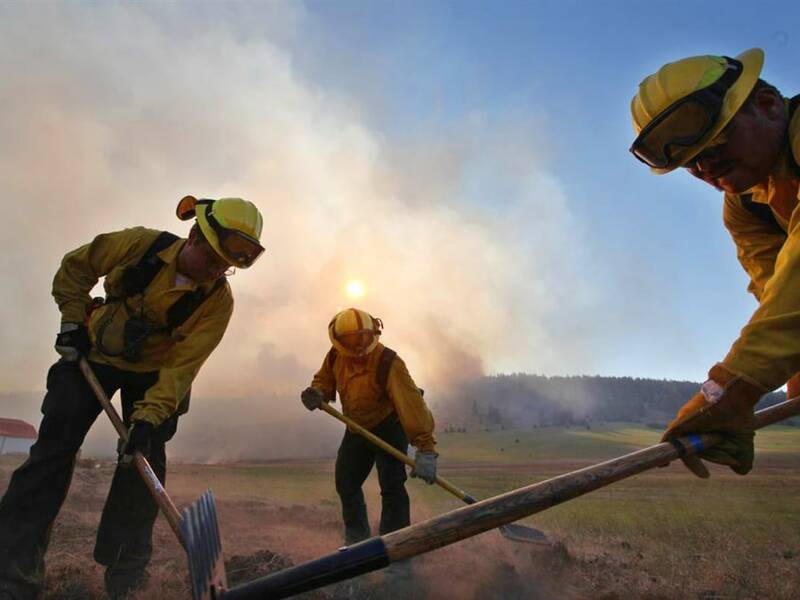 "We just want to be as ready as we can," said Huntley about preparing for the approach of the Taylor Bridge Fire, a 23,000 acre wildfire in central Washington that has already claimed about 60 homes. As fire fighting helicopters roared overhead, the Huntleys and some hired help were setting up a 15,000 gallon above-ground pool, one of two they planned to fill with water from a small pond on their property below. They wanted as much water as possible on hand to douse everything before the fire, burning just up the hill, reached their property. But water being the hot commodity it is in an event like this, the helicopters, too, were drawing from the pond, coming in low and dipping their huge red buckets into the shallow water, taking advantage of the water's close proximity to the flames. Christi stopped working long enough to take pictures of the helicopters at work with her iPad. "This is the only time I've actually been scared," she said. 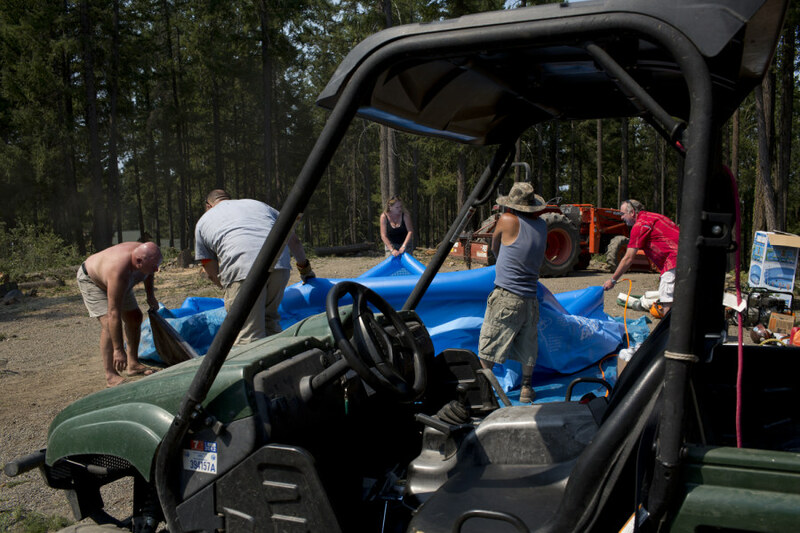 The Huntleys and employees of Huntley Lodge pitch in to assemble a 15,000 gallon above-ground pool at the lodge in Cle Elum, Wash., Thursday, Aug. 16, 2012. They planned to fill the pool and use the water in defense of the Taylor Bridge Fire, a 23,000 acre wildfire in central Washington. 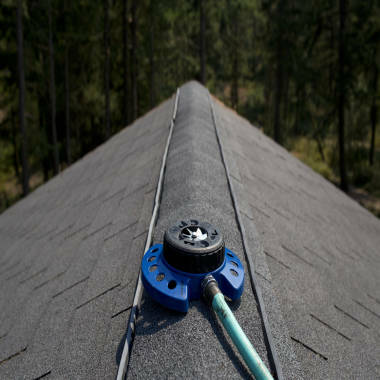 As a last-ditch effort, a sprinkler is placed on the roof of one of the cabins at Huntley Lodge in Cle Elum, Wash. The sprinkler is intended to wet the roof as a last line of defense agains the Taylor Bridge Fire. The owner of a successful auto repair business in Seattle, Greg, sprung into action when he heard about the fire. "We're trying to be proactive rather than reactive," he said. He bought pools, chain saws, hoses and pumps. One pump is strong enough to necessitate the use of a two-inch fire hose. "It does huge volumes with lots of pressure so I can spray the trees," he said. He even placed a sprinkler on the roof of each building. "That's the last thing we do before we leave, is turn on all the sprinklers," he said. Then he added, "I"m gonna stay here until they force me off the property." Even with all the activity, the helicopters, the pools, the sprinklers and the frenetic feel of getting ready for a fire, the jagged stumps of trees really stand out. Scores of trees were cut and dragged far enough away from the structures so as not to add additional fuel to the fire. Though, many of the biggest ones were still standing. "I hate to drop the trees directly around the lodge because those are 150 to 200-year-old trees," Greg said. "It would be a long time before they'd be back again." The Huntleys bought the lodge and its eight cabins five years ago to rent out to wedding parties and weekenders. At the time, the structures were in a state of neglect. "We've got over a million dollars invested in it, and that's after I bought the property," Greg said. "We absolutely love this place. We put our heart and soul into it over the last five years."